The title Golf in my Kingdom is a shameless take off on the title of Michael Murphy’s 1972 book Golf In The Kingdom which features the mythical golf professional Shivas Irons. This is my first post on this blog and the purpose of this post is to give you an idea as to my golfing habits and volume of play. This will allow you to evaluate future posts in terms of ‘does this guy actually play the game and does he know what he is talking about’. In the coming weeks and months I plan on writing posts on various golf related topics such as golf statistics, scoring strategy, meaningful practice, how to attack a golf course, equipment, which tees to use and the like. I will not delve into golf instruction as I am an amateur, not a pro and there already exists a plethora of instruction material that is at times both helpful and confusing for the average golfer. I will rather talk about common sense approaches to the game and things the average golfer can do to not only enjoy the game more and learn to become a better overall golfer and shoot lower scores. I invite readers to comment and enter into discussion as there is no right way to play this game and everyone has an opinion, some of which will no doubt be at variance with mine and those of other readers. The golf season in Manitoba is short relatively speaking. This year my golf season started on April 10th and ended on October 22nd. During those 196 days I played a total of 162 games of golf which means that there were 34 days that I did not play. My games were distributed between 16 different golf courses with the majority being played at two courses. My high score for the year was a 85 (I had several of those) and my low round was a 66, shot at the Wildewood Club on June 13th. while playing with a good friend and yes there was money on the line that day and I made a few bucks. 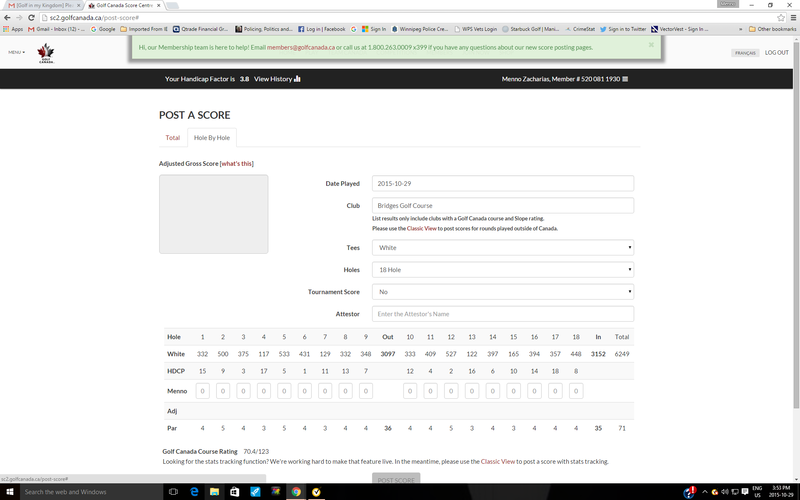 My year-long scoring average was 76.2 and my end of year handicap was 3.8 having dipped down to 1.6 in mid-summer. If you think you might find the content on this blog to be of interest and benefit to you please sign up to receive notification by email each time new content is added and by all means feel free to comment.